Lalitha Sahasranamam consists of very powerful hymns in praise of the Goddess and regular chanting of these hymns brings prosperity and happiness in life. When. chanted with meaning understood, it gives inner peace, clarity of thoughts and improves performance at work. In Me and the Mother, the inner meaning of each verse, which can be correlated to the person who chants with an involved mind, is provided in English and it is not the superficial meaning of the word. That way, the book is unique in leading you to a new level of satisfaction in life. Familiarity with Sanskrit is not essential to grasp the contents of this book. Venkataraman was born in Chennai in 1942, in a highly traditional family devoted to the pursuit of vedic knowledge, and is well versed in Sanskrit. A postgraduate in Instrument Technology from MIT, Chennai, he served in a British firm and in 1982 started his own instrument manufacture and system design. He was a visiting professor at MIT, Chennai. Blessed by great gurus, he got initiated into Shrividhya upaasana thirty years ago and had the benefit of receiving knowledge on puja activities from his father, Vazhuthur Rajagopala Sarma. Since then he has been giving lectures on how to practice philosophy in day-to-day life. He writes poems in Tamil and Sanskrit, and articles in English. He has written several dramas in Tamil. He addresses congregations during festivals and religious occasions in temples, and other places of religious significance. He also guides people on the subject of Navaavarana Puja. I got initiated into chanting of Lalitha Sahasranamam by my mother Srimati Balambal, Gayatri Mantra by my father Sri Vazhuthur Rajagopala Sarma, Veda patanam by Anna Sri N Subramania Iyer, and Sri Vidya mantropadesa by Srimathi Prabhavati Raje, a great devotee of Bhagawan Ramana Maharishi. Maha Periyavaa gave Nayana Deeksha, Sadguru Gnanaananda gave Anna Deeksha and Seshadri Swamigal showed the great path. I am blessed to do saashtaanga namaskaram to all the Guru Mandala Devataaha. I feel their presence within me. Recently, in Singapore, I participated in a group chanting of Lalitha Sahasranamam. 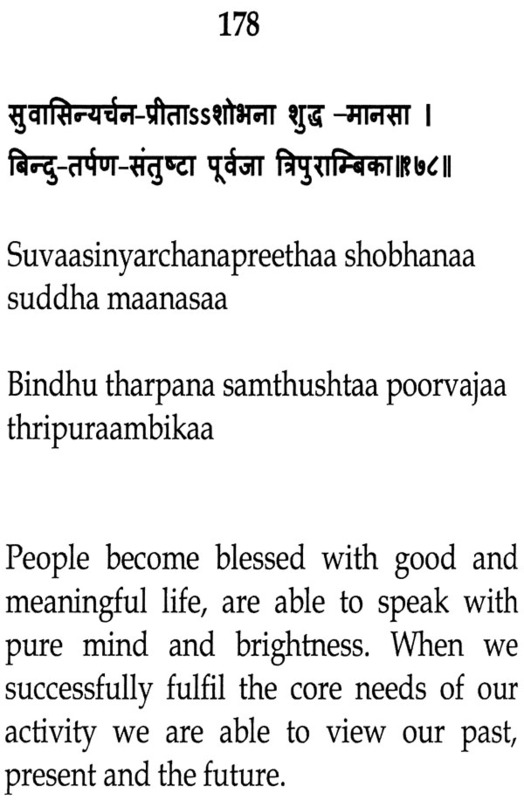 I explained the English meaning of a few slokas of the stotram which they could understand and appreciate well. They were keen to get the entire meaning of Lalitha Sahasranamam in English. Hence they requested me to give the same in the form of a book which would be useful to them and for all those people who chant. I felt this as a stimulating spark coming from the Divine Mother. So I started writing the English meaning for every sloka giving the Tattvaartham (content meaning) which would inspire the person who chants. 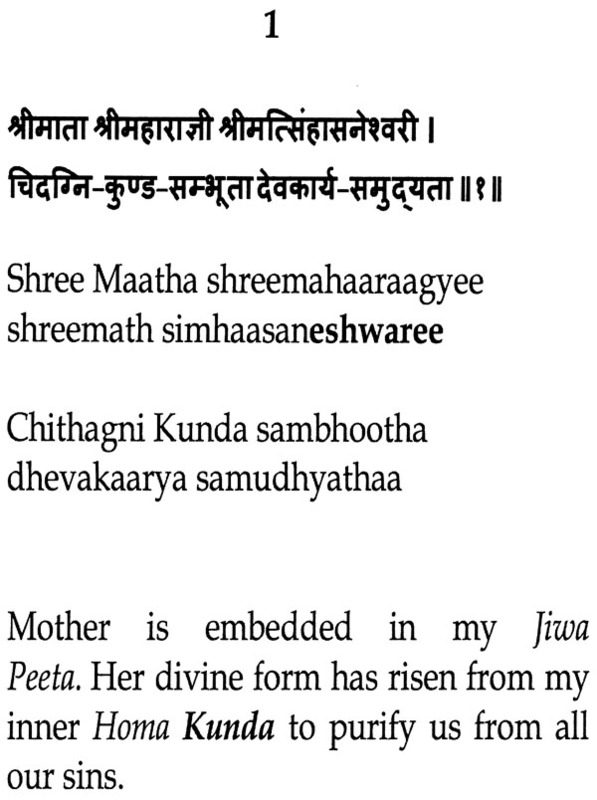 Most of the translations available in the circulations are with word meaning or literal meaning which do not convey the inner experience of the sloka. Mother was putting all the words being penned down by me for the benefit of the chanting person. There are only two sahasranamams commonly chanted everywhere namely that of Vishnu and Lalitha. Vishnu Sahasranamam was told by Bhishma to Pandavas whereas the Lalitha Sahasranamam was created by Vak Devigal, as ordained by Lalitha Parameshwari Herself and they formed the 1008 names of Lalitha. 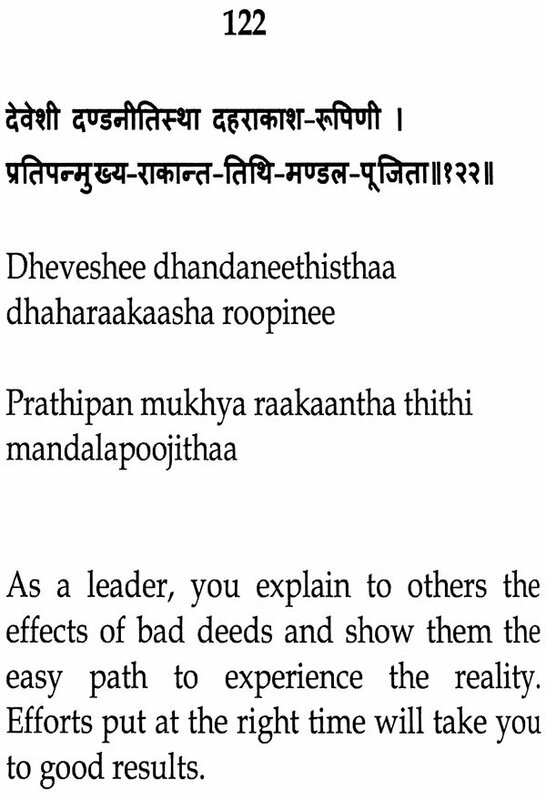 With each sloka interspersed with one letter of the fifteen letters Mantra (PANCHADASAAKSHARI). This unique feature gives the stotra the stature of a mantra. 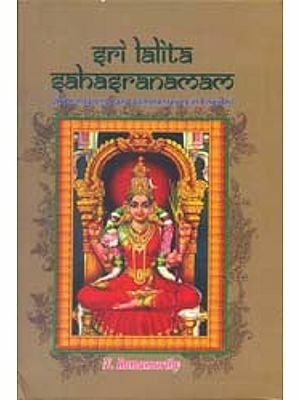 Hence unlike Vishnu stotra, which can be chanted easily by anybody at anytime, Lalitha Sahasranamam, should be learnt from a Guru to learn with proper pronounciation. For this Sanskrit knowledge is not essential. But we have to sit in a place and ignore all external diversions. We have to put our effort to concentrate mentally on the Mother whom we should start installing in our inner space deeper than our mind. This can be achieved by continuous effort. Mind is capable of creating a simhasana/ throne with the Mother seated on it. The Mother is fully ornamented with gold and precious stones. She is dressed in red which matches the colour of her lips and wears garlands made of fragrant flowers. All these can be construed in your mind with the worldly exposure you already have. Your concentration will make it a virtual reality in your inner space. When you do a puja as guided by a shastrigal, a photo or idol of The Mother is placed in front of you. We should bring life into it for which PranaPratishta is performed. For this, we cleanse our soul inside us and install the same into the idol or photo in front of you. This confirms that the Jeeva in you and the one installed in the idol are the same. Till the puja finishes, this single to dual concept should be held. During continuous practice you will realise that she is you and you are her. The Mother, when seated in your Aatma Peeta, has Lakshmi on one side and Saraswati on the other side, which signifies SRI on one side and VIDYA on the other and The Mother, is in the middle in the form of the Fifteen Letter Mantra. Thus Sri Vidya Upasana gets formed. In my experience, I have seen several miraculous and unimaginable things happening to scores of people when they attend the puja. They come with their own problems and when they concentrate and pray, they find their problems identified and getting solved, as The Mother is present in live form during the Puja. This type of situation will happen regularly to you, if only you perform in the method mentioned as above in a natural fashion and procedure without worrying about the result. The Mother blesses people through your words and thought. This unique experience is available to all of you. With The Mother fully embedded in yourself, you will experience that you are becoming a different person - caring and filled with compassion for others; having only good words and thoughts for' them. While I did not write the meaning in any pre-planned manner, I could feel Her Hand guiding I me in forming the ideas and meaning which simply came out in a continuous flow.